May Day – Something for Everyone to celebrate! Published in the 2015 Posters for Peace and Justice wall calendar. In 2012 dozens of groups around the country decided to change that. They coordinated a general strike to take place on May Day that year, encouraging people to avoid school and work and to take part in Occupy-inspired protests against economic inequality. Hugh D’Andrade contributed to the movement with this poster, inspired by a nineteenth-century May Day broadside by Walter Crane. He released the poster online, under a Creative Commons license, and encouraged people to download it and use it as they saw fit. Its reach spread far and wide on blogs, news sites, and community boards. This entry was posted in Artist Spotlight, Graphics for Change, Posters and tagged May Day, Spring, summer on May 1, 2014 by Amber Lotus Publishing. Our new Furturtle Holiday Cards are featured in the spring edition of Stationery Trends Magazine. Check out the Winter Holiday section in their Market Style Update. Amber Lotus Publishing is proud to offer these bright, quirky cards based on rock and roll gig posters by Furturtle Show Prints. 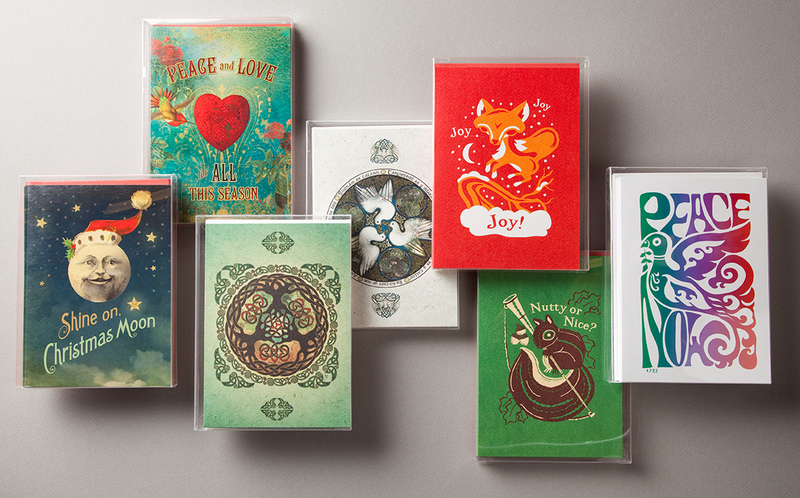 They are printed on recycled, textured watercolor card stock, which evokes the feeling of the original screen prints. Partnering with Travis Bone, the creative genius behind Furturtle Show Prints, has been a delight. 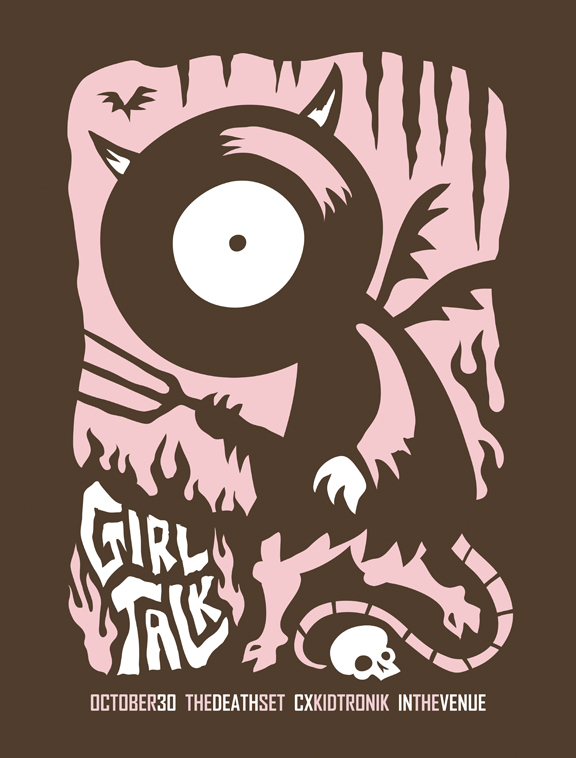 We first discovered his screen prints while researching images for our Gig Posters Wall calendar (his Girl Talk Poster is included in the 2013 edition). Travis is a prolific creator of logos, snowboard and ski graphics, labels for bottles, drawings for clothing, and all manner of illustrations for a myriad of purposes. His art has translated brilliantly into an exciting new line of holiday and occasional greeting cards. These cards will be available for purchase in July online at www.amberlotus.com or at your local retailer. This entry was posted in Artist Spotlight, Greeting Cards, Holiday Lore, Posters, Rock and Roll Posters on May 9, 2013 by Amber Lotus Publishing. This is one of our featured images in the 2011 Posters for Peace and Justice wall calendar. We now have it in a greeting Card also. We are proud to continue to champion the Poster designers and their messages in our 2013 Calendar, including a number of worthy political and environmental concepts. Some of the poster designers we are featuring in the 2013 Calendar are Luba Lukova, Micah Ian Wright, Dan McCall, Chaz Maviyane-Davies, Max Temkin and Lalo Alcaraz. This entry was posted in Artist Spotlight, Environmental Art, Graphics for Change, Posters on May 29, 2012 by Amber Lotus Publishing.